Spring has sprung – or at least it has in the fashion world. With the drab and winter-like weather we’ve had around here, I’ve decided to take on purging my closet and developing a new and improved wardrobe. Let me tell you, the bright spring colours and floral patterns I’ve been seeing in store have made me hopeful that spring is really about to start. Maybe you’re also looking forward to t-shirts and light wash jeans? Or maybe you’d like to develop your personal style for a new job, a new body, or for a new perspective. Here are some tips and tricks that may prove helpful in your fashion journey. Figure out your body type and dress for it. Are you pear-shaped? Maybe you have an hourglass figure? The best way to start is to find what your body type is, and what cuts and fits of clothing would be most flattering on you. This is a great way to build some body confidence and look more put together. Take everything out of your closet. Seriously, do it. Yes, it will be messy, but it is the best way to really figure out what you have and what you need. Here is a list of 25 essential pieces every woman needs. How many can you check off? Pack away out of season clothes. Once spring truly starts, you won’t need those bulky sweaters and coats that are taking up space. But keep them labelled nicely and within reach in case another winter-like storm hits your area too. Pull 10 basic pieces to the front of your closet and mix and match different outfits that you can wear over the next 10 days. 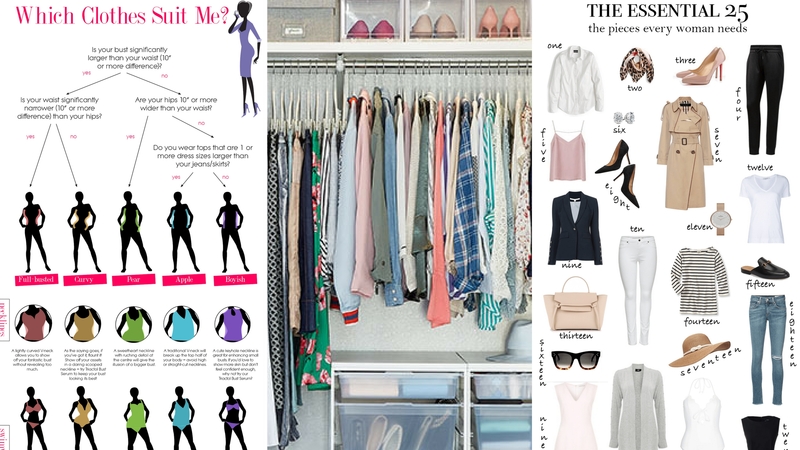 This will help you figure out if a capsule wardrobe is right for you, or if you need to modify it a little bit to suit your lifestyle. Decide what items you need. Are you headed back to work? Staying home with your little ones? Or do you have a new post baby body to dress? The type of life you live day-to-day will determine what kind of capsule wardrobe you should be aiming for. Do you need more business and formal wear? Or would you rather have comfortable and easy to pull together outfits? Take a look at some different examples of capsule wardrobes to help figure out what’s best for you. Give your closet a makeover. Maybe you need to add more shelving? Or a coat of paint? Or maybe it’s just as simple as buying new matching hangers. Give your closet a fresh new look for the season by giving it a makeover too. This is the fun part! With all your research done and your shopping list in hand, it’s time to start trying things on and bringing home some new pieces for your wardrobe. Try not to overdo it, you want to keep it light and fresh, and also leave room for anything you might want to add later on. Take a look at this colour palette for inspiration. You may already have some favorite or sentimental jewellery pieces that you wear every day. Maybe it’s time to add some new sparkle to your collection? Another great way to accessorize in spring is to add a scarf. There are lots of ways to tie and basic scarf that can add a little extra oomph to your outfit. Check out these ideas. Maybe while you were shopping you spotted a trendy jumpsuit or floral maxi dress that you just had to have? Or maybe you’ve had your eyes on a new pair of hot pink heels, or a bright colour denim? Go ahead and splurge on a couple of on trend pieces for the season. After all, fashion is all about self-expression, you should have fun with it and love what you wear! For more spring wardrobe inspiration, head to my YouTube channel and check out what looks have inspired me this spring! Don’t forget to follow Nesting Story on Instagram, Facebook, Pinterest and YouTube. Sign up for our Newsletter for weekly inspiration! I watched your video with your spring 2018 wardrobe. came to your blog to see more. I love your ideas on how to spruce up your wardrobe but I wish I could see the photos bigger as I cant since they are posted from pinterest. also wish there was more clothing samples in your blog 🙂 for more ideas.